You willll have great fun in this kitchen with its realistic lights and sounds. It features a large refrigerator and a spacious oven. Accessories include a pot, a pan, cutlery and play food. Colours and styles may vary. Requires 3x AA batteries notincluded. Dimensions: 63Lx37Wx98Hcm…. This toy costs approximately £39.99 (for the latest and best prices make sure you check our retailer list for the Redbox Pink Electronic Kitchen above). 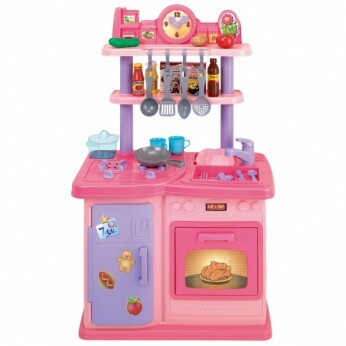 In our review of Redbox Pink Electronic Kitchen we classed it as being suitable for ages 1 to 3 years but recommend you check the manufacturer specific advice before purchasing.